In a small pitcher, combine sugar and water. Stir until sugar dissolves. Slice berries in small pieces. Fill 3 ice trays with sugar water about 2/3 of the way up. Place pieces of berries and a mint leaf into each. Freeze for 4-8 hours. Serve with water or club soda. You can serve with lime soda for additional sweetness. Add edible flowers for a pretty springtime beverage. 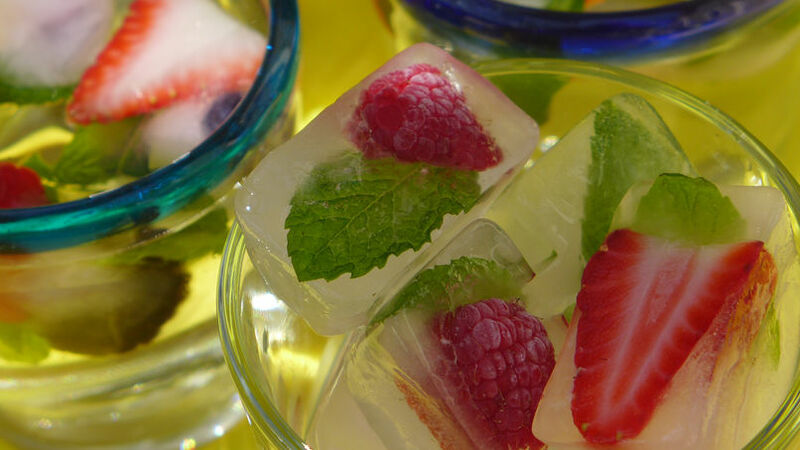 A quick way to make party drinks prettier and tastier is to add some fruit-infused ice cubes. My favorite variety is berries with mint, which can be added to just about any drink! Impress your guests and add some flavor to plain water or cocktails. You can even skip the sugar for a sugar-free version.